Stats, Maps n Pix: From CartoDB to CARTO - the future of interactive mapping? From CartoDB to CARTO - the future of interactive mapping? I've been using CartoDB (now CARTO) for a few years for interactive mapping - and have always loved what it can do - from basic mapping to much more complex analysis. Now, with the re-brand as CARTO and the advanced analytical tools available through the new Builder interface it's on a new level. So, credit where credit's due - I thought I'd do a short piece on this now to give my take on the new interface. But first, here's a little gif of me playing around with some commute data - which you can also download yourself if you want to. The dataset was used as part of a project I've been working on with Garrett Nelson - but hopefully more on that in future. If you've used the old CartoDB interface, the new Builder one might be a bit confusing at first - though you may not actually be able to get access to it yet. But once you have played around with it for a few minutes it soon becomes pretty intuitive. 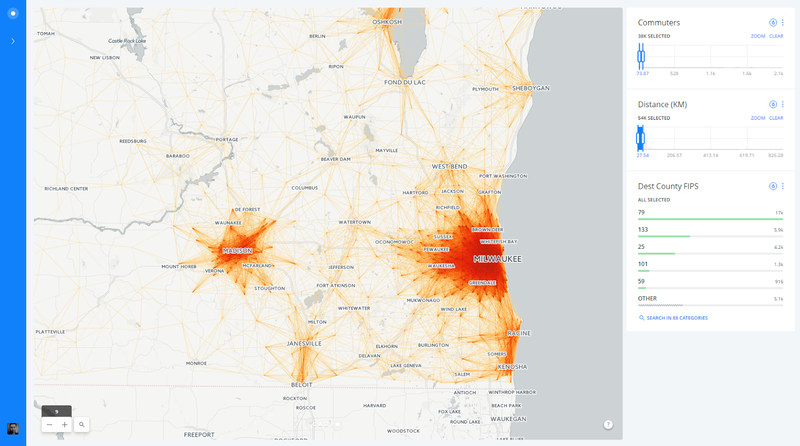 I uploaded a sub-set of commute flow lines for Minnesota and Wisconsin and then decided to add widgets so that I could filter the data using line distance, FIPS codes and commute volumes - as you should be able to see in the larger image below. This is very much just a little data sample, but if you want to play around with the interactive CARTO map you can see it here. It's not very pretty and the origins and destinations don't have place names right now - only FIPS codes - but the principle is the same. The Widget interface takes a little bit of getting used to as well, but is really easy to use once you've figured out what's what. See below for a screenshot. Any negatives to report? For me, not now. I'm just enjoying the enhanced analytical tools at hand. But if I was being greedy... I'm not massively keen on the default legends, there doesn't appear to be an 'addition' blend mode and the snap alignment of shapes in the old map editor has me a little flummoxed, but these are minor grumbles. I'm not getting paid to promote this and I don't know anyone at CARTO - honest - I just think they have produced something that works brilliantly, is simple yet powerful and allows us to manipulate, analyse and share our data in new ways. There are other tools out there but the new Builder, for me, takes things to the next level for a mass audience. To answer the question in the title of the blog: is CARTO the future of interactive mapping, then? Not the future, but probably a very big part of it. Notes: really, they didn't pay me. Data used are from the American Community Survey. I wrote a working paper on it already. I also blogged about it on my old blog. Finally, if you're one of the few people in the world not to have seen it, Mark Evans created this beautiful site with the same data.